Defrost Puff Pastry according to directions on the box. Cut one pastry sheet in half lengthwise to form 2 rectangles. Fold 1 rectangle in half lengthwise. Using a sharp knife, cut 9 slits through the folded side to within ½-inch of the opposite edge. Line a baking sheet with parchment paper and placed the uncut half of the pastry on the sheet. Sprinkle filling onto the pastry to ½ inches of the edge. Unfold the cut pastry and place on top of the filling and press the edges to seal. Melt butter and add to the powered sugar. Add lemon juice until you get the thickness you want.. I used about ¼ of a cup. ½ cup of Raspberry Preserves or any other type you prefer. Line a baking sheet with parchment paper and placed the uncut half of the pastry on the sheet. Spread preserves onto the pastry to ½ inches of the edge. I know some obscenities came out of my mouth and before I knew it Matt came running into the kitchen, the phone starts ringing with my mom on the other end and I have my hand under running water.... Mothers instinct, eh? Tonight is leftover's night... Last night I made dinner for Matt's Grandma for her birthday and tonight were the left overs.. I made Pesto Penne... Super simple, especially for a work night and yummy! 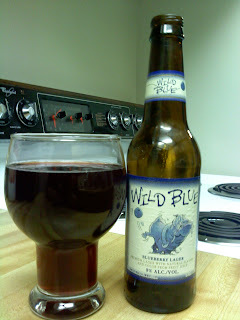 The left overs are not the Blues... My beer of choice is... Wild Blue a blueberry based beer.... It is one of the best blueberry beer's I've has so far... only disappointment is Blue Dawg Brewing is owned by Anheuser-Busch! So much for it being from a micro-brewery.... but that is the big beer for you now... Guess that is what I get for checking them out online... It does make me upset that big beer is pretending to be micro breweries... If you are into documentaries, check out Beer Wars . It's pretty interesting and if you have nextflix, it's on instant play. Anyways! let's get on to the recipe! 1. Cook the Penne, when finished drain and return to pot. 2. 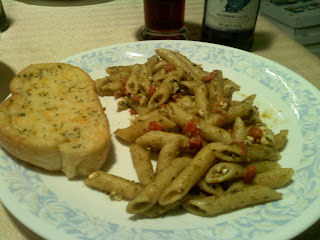 Stir in Pesto and Roasted Peppers. Last night we had our weekly Saturday Magic Night... Yes, I am a little bit of a geek ;) Normal SMN's include ordering pizza, a few beers and playing Magic until the wee hours of the night. So if you're down the waterfront, check this place out. This cookie is to die for!